Baha Mar, the $3.5 billion resort complex marking the dramatic resurgence of a golden stretch of beachfront once called The Bahamian Riviera has opened an office in Hong Kong, a strategic move intended to strengthen sales and marketing capabilities within Asia-Pacific. Located in the prestigious International Finance Center overlooking Hong Kong Harbor, Baha Mar's new offices will be managed by Mabel Chau, the newly appointed Regional Director of Sales & Marketing, Asia-Pacific. "A physical presence in Hong Kong allows us to more efficiently support marketing efforts in the region, promote The Bahamas in general and our project in particular" said Richard English, Senior VP for Baha Mar. The Chinese partnerships with Baha Mar are unprecedented in the hospitality industry and include the Export-Import Bank of China, lending almost exclusively to governments and financial institutions. Additionally, China State Construction Engineering Corporation, China's largest construction company, plans to turn into a reality Baha Mar's vision of establishing a unique, "destination within a destination" featuring stunning structures that complement the authentic beauty of The Bahamas. CSCEC, with total assets of approximately $43 billion, believes Baha Mar will be the pinnacle of its achievements to date, and indicative of its finest work. 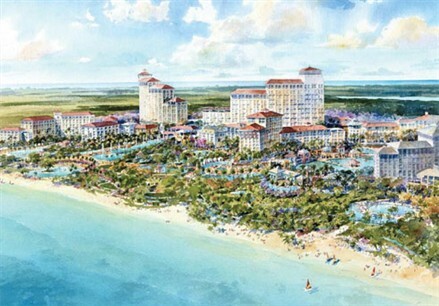 The 1,000-acre, $3.5 billion resort, gaming and entertainment complex slated to open in late 2014, will boast some of the world's most famous hotel brands, including Rosewood Hotels & Resorts, Morgans Hotel Group and Hyatt Hotels & Resorts, as well as a Casino Hotel, creating 2,250 new rooms within four spectacular new hotels. Baha Mar's stunning, new 100,000 square-foot casino will be the largest in the Caribbean, and the only true gaming experience outside Las Vegas. Baha Mar will also feature the largest convention center in The Bahamas, with 200,000 square feet of space, which can also double as an entertainment venue and sports arena. Other amenities will include a 50,000 square-foot retail village combining an upscale shopping experience with Bahamian arts and crafts, chef-branded restaurants and entertainment venues. A 20-acre Eco Water Park and pool experience, and three unique spas, including the largest spa in the Caribbean, will be set on the along 3,000 feet of the most pristine beach in the world. The planned 18-hole Jack Nicklaus Signature Course is one of a select few such top-tier Nicklaus courses in the world, and will be the only true championship course in The Bahamas.